I was particularly drawn to Douglas Crimp’s seminal essay “Art Acts Up: A Graphic Response to AIDS,” in the Summer 1990 issue of OUT/LOOK. Crimp’s essay offers an overview of early artistic and graphic responses to the AIDS crisis, and touches on the ever-salient ephemerality and citational practices of queer archives. 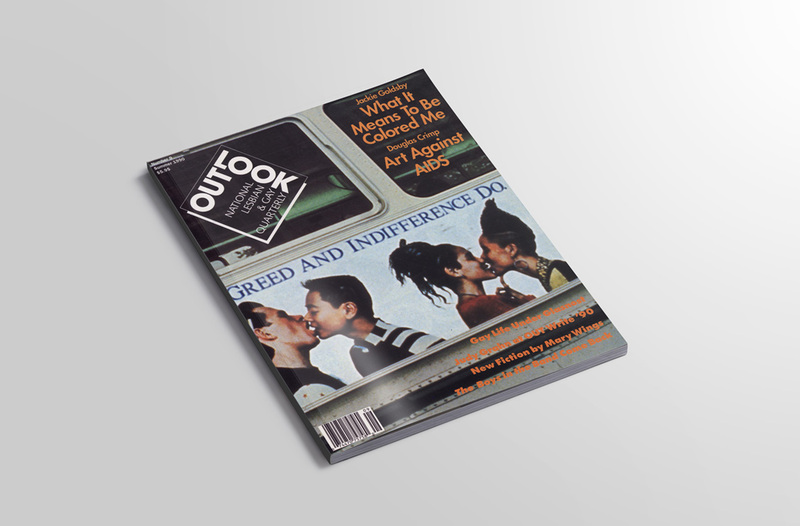 The cover of the Summer 1990 OUT/LOOK features an grainy shot of Gran Fury’s renowned bus-side installation “Kissing Doesn’t Kill: Greed and Indifference Do” (1989). It wraps around the cover; the front reading “–Greed and Indifference Do,” and the back ‘Kissing Doesn’t Kill—”. By changing the usual order of looking at the image, editors force the reader to move the magazine around to view it in its original order. Read from front to back it would say instead, “Greed and Indifference Do— Kissing Doesn’t Kill.” This reorientation disrupts a visual already meant to disrupt; one has to linger with the image to understand it again. I’ve seen this picture many times, usually as a poster in queer community spaces.3 It is so ubiquitous I’d never thought to switch the reading order, or to think about it in-situ. If we think of ephemera as moving in and out of view, “Kissing Doesn’t Kill” moved quickly with busses in and out of the field of vision, and as the cover of OUT/LOOK, moves around and back and forth to align and re-align our perspective. The Society of American Archivists defines ephemera as “Materials, usually printed documents, created for a specific, limited purpose, and generally designed to be discarded after use.”4 Ephemera could include zines, posters, buttons, magazines, broadsheets. Wheat-pasted to telephone poles, flying out of hands into pockets and gutters, affixed on the walls of public bathrooms, ephemera’s discardability allows it to pass under the radar, smuggled between friends, circulated in brown paper envelopes. It’s difficult to create a queer archive because our histories are often accounted for through physically ephemeral objects. Also, as many archival scholars have noted, marginalized subjects frequently fail to appear in “traditional” archives, or and if they do, appear as aberrant, irreconcilable within the ordered records. For performance scholar José Esteban Muñoz, “Ephemera… is linked to alternate modes of textuality and narrativity like memory and performance: it is all those things that remain after a performance, a kind of evidence of what has transpired but certainly not the thing itself.” An ephemeral object is often not the thing itself: it is the trace that remains after the event. It only offers a tiny portion of what happened. In this sense, ephemerality becomes a process of “following traces, glimmers, residues, and specks of things.”5 Ephemeral archives are a part of queer citational practice, in that they manifest the impossibility of representing queer history in its totality, instead urging those who access them to utilize the affectual traces and imperfect memories of the anecdotal and fleeting. Douglas Crimp’s article, “Art Acts Up: A Graphic Response to AIDS,” in the aforementioned OUT/LOOK issue historicizes ephemeral responses to the AIDS crisis, and the activist groups that created buttons, posters, shirts, installations, and more. SILENCE=DEATH and other iconic images from the period were emblazoned on t-shirts, buttons, and more. These objects moved through closets and hands, and as Crimp writes, became logos worn, wheatpasted, and shared through “small, everyday direct acts … that makes SILENCE=DEATH signify beyond a community of lesbian and gay cognoscenti.”6 Ephemeral objects went hand-in-hand with ephemeral acts that were critical in drawing attention to the AIDS crisis, which itself threatened to make queer lives more ephemeral that they already were. While the ephemera of AIDS activism is now considered worth archiving, Crimp noted at the time that the works of groups like Gran Fury weren’t considered art. He points to the omission of AIDS activist art from the 1988 MOMA exhibition “Committed to Print: Social and Political Themes in Recent American Art” as particularly galling. A narrative of political ephemera that privileged works on paper by well-known artists left little room for the topical ephemeral actions and objects produced by ACT UP and other AIDS activists. Citation is traditionally about using primary and secondary evidence to establish an accurate understanding of history. Footnotes and endnotes carry the weight of academic authority and structures. But we can think of citation as more a way of reading between the lines, a way of threading multiple narratives through a work, different ways of performing. A feminist and queer citational practice operates in a performative way beyond the solely evidentiary, calling upon unreliable, incomplete, unknowable, and ephemeral sources to weave together narratives for a past filled with gaps, multiple meanings, and direct acts of subversion. Queer artists and thinkers are already creating and embodying alternative citational practices to pass on queer knowledge for a history just as much about the transient and the half-remembered as the well-documented. It is a way to remember those who came before when we cannot have full access to them. As archivists we are painfully aware of the brief trace ephemeral objects offer. 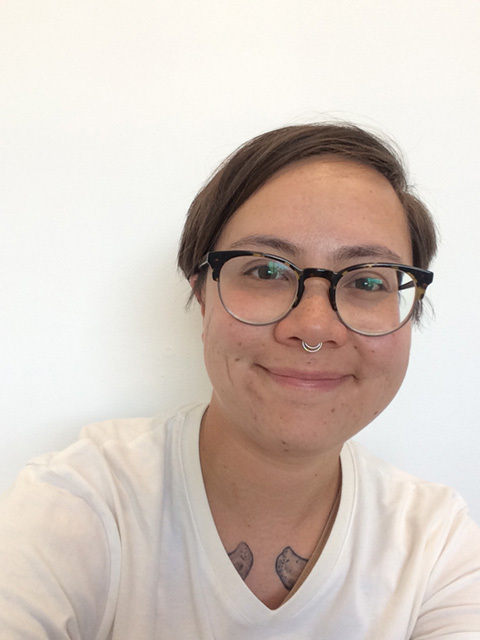 With the founding of queer archives like the GLBT Historical Society and the ONE National Gay and Lesbian Archives, there is an increasing concern for preserving and responding to queer ephemeral objects. While some of the ephemeral objects of the AIDS activism of the late ’80s and early ’90s have survived to end up in archival boxes and UV protected displays, there will always be a gap. The objects that remain cannot speak for everything left behind. How, then, do we look at ephemeral objects like OUT/LOOK or SILENCE=DEATH buttons with queer citational and archival perspectives? This anecdote signals the ways in which ephemeral acts and objects must perform citational, ephemeral, and historical functions: the story is repeated in different iterations, by those who were there, who saw it in television, or have heard the story second-hand. Objects such as the Cher t-shirt and the OUT/LOOK magazine that cites it, speak to a specific moment in history. While these objects have a referential quality, they are still unable to fully function as a comprehensive archive and narrative of that crushing and transformative era. Much of that time, those people, objects and acts, are gone. And so these ephemera stand in for all that is fleeting, marginalized, and in doing so, obligate us to try and remember. 1 Martha Kenney, “Air Pollution, Digital Smog, and the Art of Citation,” LXAQ Issue 1, September 2016, accessed 28 January 2017, http://sfaq.us/2016/09/style-wars-air-pollution-digital-smog-and-the-art-of-citation/. 2 José Esteban Muñoz, “Ephemera as Evidence: Introductory Notes to Queer Acts,” Women & Performance: A Journal of Feminist Theory 8:2 (1996): 11. 3 Sometimes when I think of queer archives I think of the posters that have lined the walls of the many communal houses I have lived in, their edges curling and yellowing. They linger, gathering dust and connecting us. A guest comes to dinner and says “I was at that show too, it was terrible.” Or “I remember that bar, I met my first boyfriend there.” By hanging them on the wall they long outlive their original purpose (get everyone to come to the protest/show/party) but continue to bring us together and remind us of the community and history that has been built. 4 “Ephemera,” Society for American Archivists, accessed May 29, 2017, https://www2.archivists.org/glossary/terms/e/ephemera. Julian Wong-Nelson is an archivist and writer. They live in San Francisco, California.